Relishing a challenge and wanting to have a real chance of power, I stepped into the shoes of Ed Milliband with the computer playing the part of the other parties (including a small rather unrealistic bloc of Independents who I probably should have turned off at the start – they eventually won four seats). Having won a famous victory keeping Gordon Brown in Downing Street in the earlier version of the game, I was initially confident. But it was soon clear I was up against it. Grimly it was quickly evident that I needed to fight a war on two fronts: one against the SNP in Scotland to try and prevent a wipeout of Labour seats – alarming to see Glasgow and Strathcydle flashing up as margins along with the familiar English market towns; the second against the familiar Tory opposition in the Midlands, outler London and the South East of England. In Scotland I focused my energies on the Lowlands going for a negative campaign attacking the SNP on devolution, family policy and economic competence and targetting key seats and building organisation to fight a ground war. But the SNP were: it was hard to land a blow on them and expensive adds repeated backfired and even my extensive spinning when a big scandal erupted. Attacking the Tories in England proved easier: ads on the NHS, families and tax all went down well the voters, although the polls refused to move and then suggested the Tories were gaining ground – provoking a collapse in headquarters morale – before the People’s Party recovered as I stoked up the billboard advertising. Squeezed resources – and a growing obsession with defeating the Scots Nats – saw my position in the Home Counties detiorate as target seats like Hastings went (and in the end stayed) Tory. In a last throw the dice in April I also launched attack ads on the Greens and the liberals trying to squeeze ever progressive vote (hopefully) in my direction. 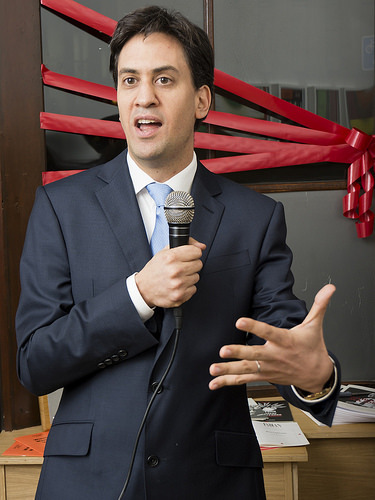 I quickly worked out that Ed Miliband was not a campaigning asset. Barnstorming the constituencies with Ed was ineffective to the point of being a waste of time and he was positively toxic North of the border. I quickly kept him confined confined to a few well received set piece policy speeches and rallies in the North of England and Midlands and invested some time setting up Harriet Harman to tour the marginals. Despite my investing heavily in his debating skills, Ed also lost out badly in all three debates, trailing Cameron in the final head-to-head and being pushed to the margins by a triumphant Farage in the first one. (Farage’s star rather faded in the second debate when all other party leaders ganged up on him). The result was an unexpected but distinctly Pyrrhic victory for Ed Milliband: a hung parliament with Labour (295) well ahead on seats over the Tories (263) but narrowly behind on the popular vote (29.1% – 29.6%). The real winners, although not spectacularly, were UKIP coming in with 15% of the vote and 8 seats, but – fortunately for me – the expected Lib Dem meltdown took place on a less than apolocaltypic scale. Nick Clegg’s party pulled in 12% and saw its seats roughly halved to 27. My efforts to stem the SNP tide were only partly successful: my bare knuckle fight against the Nats saw Labour narrowly emergence largest party in the Lowlands in vote share and the clear winner in terms of seats (18 – 7) – some achievement I think – but the SNP soared away in the North East Scotland and the Highlands. In the end Nicola Sturgeon’s party won 34 seats, a clear majority in Scotland. I really should have targetted seats better. The result? Alas the beta-version I was playing was too buggy to allow me to dealve down to constituency-by- constituency that would have some politics lecturers seating up all night, although I do know that my last minute efforts to dish the Greens in Brighton, Bristol and Norwich (it was a relentlessly negative campaign I’m afraid) paid dividends and deprived Caroline Lucas of her seat. But in the end the numbers told there own story: Ed Milliband in Downing Street by the seat of his pants with the only viable government this time a minority Lib-Lab Coalition ( = 322 seats, four short of a majority) propped upon on some confidence-and-supply basis by the the SNP or gaining the barest of those four independent or Northern Ireland’s handful of SDLP member (helped by the fact that Sinn Fein MPs never take their seats in Westminster). But surely a bumpy ride ahead for a weak government with the Tories aggrieved having topping the poll and ended up in opposition UKIP heavily underpresented? What would ensue? A right-wing push for electoral reform? A UKIP-Conservative pact? 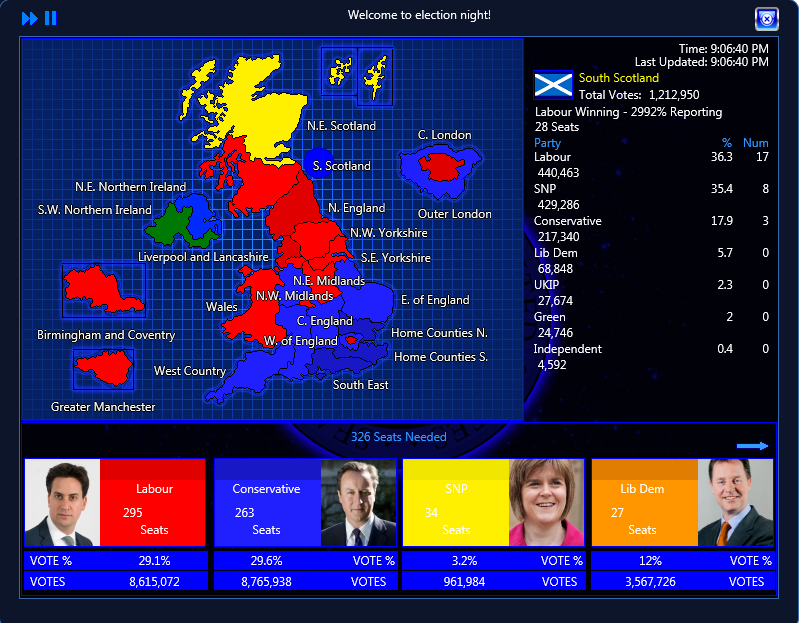 As with the real 2015 election, Prime Minister Infinity seems a game that nobody can win.